The Occupy movement in Iowa has posed challenges for supporters and opponents alike, especially in Des Moines and Iowa City. State offices across the country have wrestled with how much to be involved with the protests, which carry a general message of anger at Wall Street and overall economic inequity. Traditionally, the ACLU has wholeheartedly supported civil disobedience of unjust and unconstitutional laws. But the “occupiers” require special consideration because they are not breaking laws related to their message—those on finance or banking--but instead are challenging laws about public spaces and safety. Regardless, the ACLU of Iowa is doing its part to make sure that, within the law, this form of free speech is supported. We have been working with Occupy protestors, providing legal advice to “occupiers” and providing them with written information on their legal rights. The situation in Iowa and elsewhere is about to become more challenging. Local protestors are increasingly pressed to choose between staying warm and obeying city regulations on electrical usage, fire codes, and public health issues. 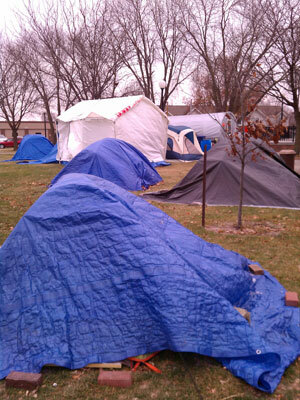 Moreover, “occupiers” from around the country have been invited to come here during the Iowa caucuses. The ACLU, as much as any organization, understands that political discourse and energy are essential to a healthy democracy. We will continue to do what it can to this cornerstone of freedom—no matter what the message and no matter how long the protestors press to make their message known.